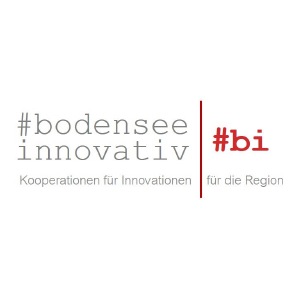 The idea for #bodenseeinnovativ was created as part of the RegioWIN competition starting with 2013. Lead Partner was from the beginning Wirtschaftsförderung Bodenseekreis, who was in charge of drafting the concept and was supported by numerous other project partners. 2015 was awarded the Lake Constance region WINNregion, and 2016 was granted the grant application for #bodenseeinnovativly in the amount of 1,9 million euros. Another lighthouse project is the planned Regional Innovation and Technology Transfer Center RITZ, which will be built from 2018. Expand and maintain regional competitiveness. Long-term technological, ecological and demographic changes pose new challenges for regions, districts, cities and municipalities in Baden-Württemberg. RegioWIN - Regional competitiveness through innovation and sustainability - emerged as a joint, structural and regional policy measure of the Baden-Württemberg ministries for finance and economy, for science, research and art as well as for rural area and consumer protection. It is a key programmatic element of the country's ERDF strategy (ERDF = European Regional Development Fund). Funding for the ERDF focuses on the promotion of applied research, research and innovation infrastructures, endogenous regional development potential and the networking of business and science with a view to technology transfer. 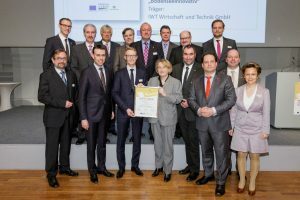 Representatives of the state and the EU, together with the managing directors of the IWT and the Wirtschaftsförderung Bodenseekreis as well as representatives from industry and politics during the presentation of the certificates in Stuttgart, in which the eleven regional development concepts were awarded.